Releasing today, Donkey Kong Country: Tropical Freeze  returns fans to a world full of familiar challenges and rewards with new enemies and new abilities – and a reminder that in DK’s world, timing truly is everything. In fact, some levels in this latest iteration of the franchise bring a stark truism to the adage “he who hesitates is lost” because in some levels there really isn’t any time to look around. It took me more than a few lives to get through some levels, as the difficulty at times seemed to ramp up rather quickly – sometimes frustratingly so – but it’s also easy to rack up a healthy store of “back-up lives” in this game, so it’s all good. Tropical Freeze opens with a short cinematic that introduces the world’s new invading baddies and bosses – the Snowmads – who interrupt Donkey’s birthday celebration by blasting the Kong crew to a far off island and then proceed to turn our hero’s own beloved island into a winter wonderland. I opted to play through the game with the Wii U’s GamePad as my controller of choice, hoping that Nintendo would make full use of the Wii U’s abilities and the immersive possibilities with the GamePad, but the only special advantage in using the GamePad is allowing the player to play on the GamePad’s screen instead of the TV. Players can also opt to use the Wiimote, Wiimote and Nunchuk, or the Pro Controller – whichever controller best compliments the player’s style. Fans who have played all of the previous franchise titles, such as myself, will be to immediately set to the task of clearing levels and collecting the treasures that will unlock new areas to explore. As expected, the game’s levels are highly detailed and make the most of the Wii U’s graphics engine, with more than a few taking full advantage of the 3D camera. The attention to level design by the team at Retro is worth more than a few points in the plus column, as are the mechanics that control the antics and personalities both friends and enemies. Even the smallest detail, such as DK peeking out of a barrel if you take more than a couple of seconds to blast him to his next destination, bring an enjoyable nuance to the game, and tends to make one look for more of these small touches throughout the game. Tropical Freeze has all of the elements we’ve come to expect in a Donkey Kong title – hidden levels full of bananas to gather in order to earn a puzzle piece, puzzle pieces cleverly hidden with just a hint that there might be more to that cave or ledge than meets the eye, letter blocks that can be a challenge to reach but that offer special rewards when you collect them all and a variety big mean bosses. If you’re having difficulty finding all of the puzzle pieces, you can purchase the assistance of Squawks, who will provide small animated clues when you near a hidden piece. Mercenary Treasure Hunter Squawks is available from Funky Kong’s brand new beach store, where you can buy other helpful items such as potions, hearts and spare buddy barrels. You can also put a few coins in the vending machine and get a collectible toy that will be held on your “Extras” screen, and you’ll also notice that there are spaces to fill with dioramas, images and music. Rambi the Rhino is also back for some more block-smashing fun – and he also peeks out of the barrel when players take too long to push the detonator. 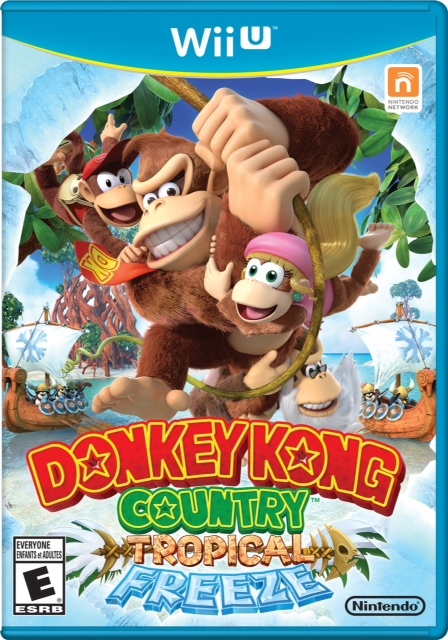 Tropical Freeze also engulfs the player’s auditory senses with a return to the Donkey Kong theme that gets stuck in everybody’s head, and there are also some new tunes from composer David Wise, who has added some playful music to go along with the varying levels in each of the six worlds on the map. It should be noted that David Wise was the composer for the original Donkey Kong Country, so it is he we can blame for all of those ear worm riffs that remain even when the game is not in use. The layering of melodies simply adds another level of depth to the experience of working through the game. No hero can save a world entirely on his own, and our big ape is no different. Cranky, Diddy and Dixie Kong all come along for the ride – or become the character for a player two if you choose to play the game in co-op mode. Diddy still has his rocket pack, Dixie’s ponytail doubles as a helicopter (or submersible) rotor and Cranky’s cane turns into a pogo stick – or can be used to whack underwater enemies. Retro’s level designers have cleverly introduced each character in levels best suited to his or her buddy abilities, but later on it’s up to the player to choose the best buddy for the job, which adds another level of replayability to the gathering of coins, letters, puzzle pieces and treasures. I won’t go into the two player co-op experience, as those of you who are regular readers know, I am an antisocial gamer and prefer single player titles. A new addition to the game is the “High Five Meter” which offers a screen-clearing ability when full. Making use of this ability can usually end in not only clearing a path of enemies, but in coins or hearts that you can nab. While I have very little to complain about with Tropical Breeze, I would have liked to have been able to make use of the GamePad in some way – perhaps an easier way to choose levels or worlds, or for shopping and equipping, but all in all, the lack of use for the GamePad as anything other than a big controller is no cause to avoid the title. I also would’ve liked more control over the items I equip, instead of their uses being automatic at the game’s discretion, but I do like that I could choose whether to use the D-pad or the left stick on my GamePad. Of course, if the GamePad had an extended purpose for on-TV gameplay, I’d probably not like that it would be sacrificed when playing off-TV, much like that in Legend of Zelda: Wind Waker HD. The only other teeny little thing that bothers me is the length of time for screen loading. I expect that with the degree of difficulty in some levels and the fact that I like to find all of the treasures, collectibles and hidden areas, Donkey Kong Country: Tropical Freeze will keep me occupied for many hours, much longer than the 10-15 that seems to be the estimated time of game completion being bantered about on the internet. For those who want to extend their play even more, there are the Timed Challenges which offer Bronze, Silver and Gold medals along with the ability to upload your scores for other players and friends to see as a replay. All in all, except for the frustratingly difficult bits, I am thoroughly enjoying my journey through Donkey Kong’s newest offering and award Tropical Freeze a well-earned score of 89/100 bananas. 2 Comments To "Review: Donkey Kong Returns With Tropical Freeze"